This statistic shows the results of a survey regarding Christmas spending in the United Kingdom (UK) in 2015 compared to last year. The survey found that 23 percent of respondents plan to spend more on gifts for others while 20 percent plan to spend less. 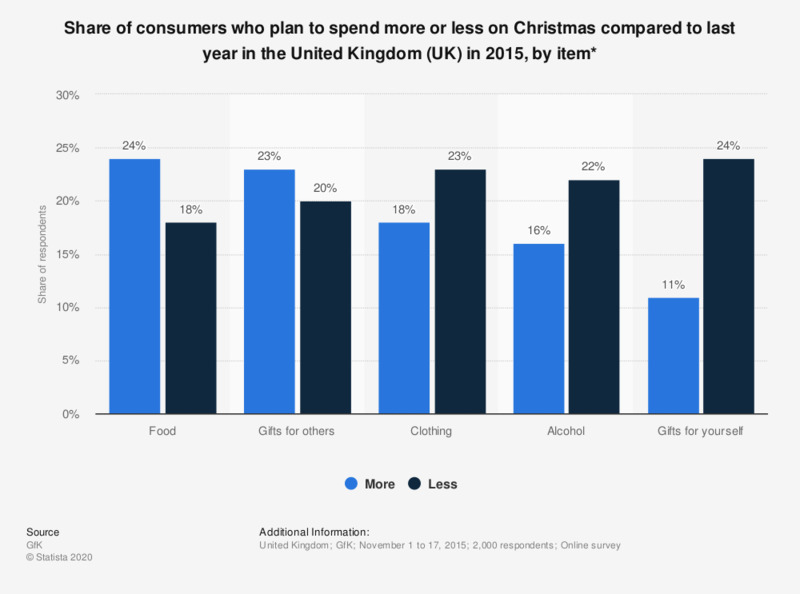 * The question was phrased by the source as follows: "In the run up to Christmas 2015 do you intend to spend more, less or the same on the following items (from list of 10) compared to the same time last year?" Average spending on Christmas gifts in the U.S.
What are your spending priorities for this year's Christmas season? Roughly how much money do you think you personally will spend on Christmas gifts this year in October? Thinking about your Christmas spending this year, are you most likely to...? When individuals start worrying about Christmas presents? Compared to last year, how much do you expect to spend this Christmas? When do consumers plan to start their 2015 holiday shopping?